Every day Correctional Officers at the Jefferson Parish Sheriff’s Office work behind the scenes to keep our jails running smoothly, processing prisoners and ensuring the security of our prison system, and in turn, our Parish and our community. 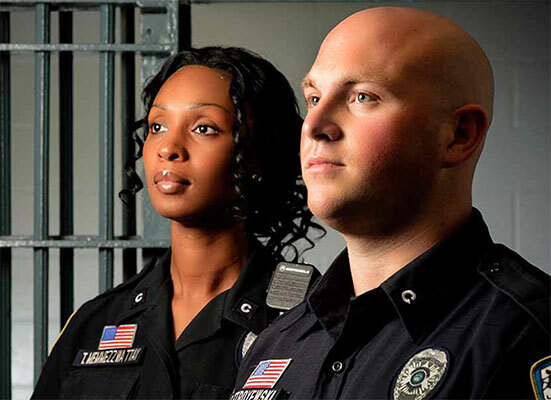 Correctional Officers are responsible for the care, custody and control of inmates who have been incarcerated in the Jefferson Parish Correctional Center and are awaiting trial while on remand or who have been convicted of a crime and sentenced to serve time in the facility. Duties are performed under the supervision of higher ranking officers and in accordance with operated procedures of JPCC. Correctional Officers are required to pass a mandatory training session and continue in-service-training throughout their career. Graduate from an accredited senior high school or GED equivalent. Possess a valid driver’s license. Must be a US citizen and be at least 18 years of age. Must be able to work rotating shift assignments and maintain proper attendance. Functions And Skills: Monitor inmates for unusual behavior, improper conduct, or signs of conflict. Defuse disruptive behavior of inmates by verbal interventions. Control disruptive behavior of inmates by verbal orders or appropriate use of physical force. Use communications skills to detect inmate problems such as suicide risk, drug usage, etc. Search inmates by pat or strip method to detect and confiscate contraband. Search all areas of the facility to ensure there are no security breaches or contraband. Performs head counts to visually confirm the presence of all inmates. Responds to all emergency situations in facility such as medical issues or fire. Writes narrative reports describing events that have happened, disciplinary reports, etc. Read and write short notes into log book in order to communicate information between shifts. Opens and closes cell gates or doors to restricted areas allowing staff to enter and exit. Use portable two way radio to communicate to other officers and staff members. $28,640 starting salary, with potential to make $30,143 after just 6 months. A $6,000 state supplemental pay is also available after POST certification.